Despite the continued rhetoric that government expenditures have exploded under Obama, the truth is the opposite. Government expenditures have been contracting in the period leading up to the election. This contraction has led to slower economic growth and has hurt Obama’s re-election chances. Previous posts on this blog (here, here, and here) have looked at the paths of government expenditures and government employment from either presidential inauguration dates or around business cycle peaks. This post will look at the paths leading up to re-election dates. 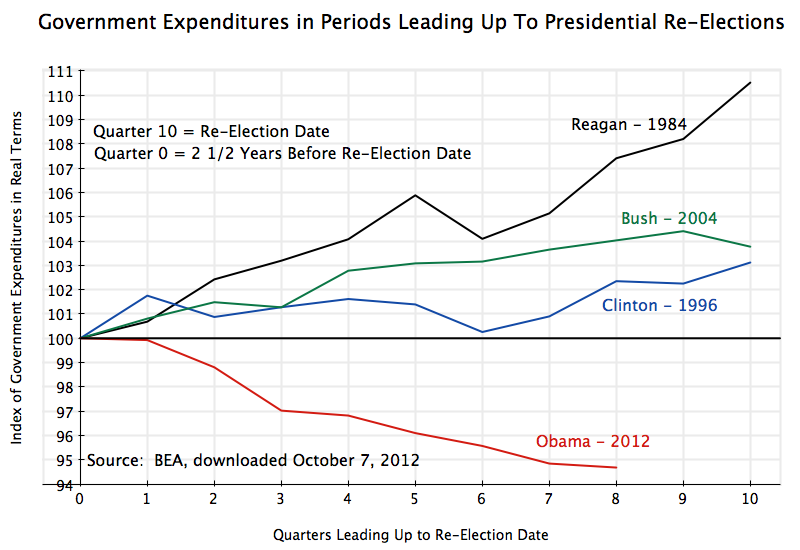 The figure above shows the path government expenditures have followed in the 2 1/2 years leading up to the presidential re-election dates, for Obama as well as Reagan, Clinton, and the second Bush. The data is taken from the GDP accounts, and shows real government expenditures on consumption and investment, a component of GDP. They come from the Bureau of Economic Analysis of the US Department of Commerce. Note that this is all of government, including state and local. We do not yet have data yet for the third quarter of 2012 (the initial estimate will be released later in October) nor obviously for the fourth quarter. But the pattern is clear. Government expenditures (including state and local) have been falling steadily and sharply under Obama in the period leading up to the re-election date, and as of the second quarter of 2012 were over 5% below where they were in the second quarter of 2010. At the comparable point under Clinton they were over 2% higher, under Bush Jr. they were 4% higher, and under the conservative idol Reagan they were 7 1/2% higher. Stated another way, government spending under Obama as of the second quarter of 2012 would have had to been 13.4% higher to have matched where it was under Reagan. Government expenditures continued to rise rapidly under Reagan. By the date of the 1984 election, the expenditures were 10 1/2% higher in real terms than 2 1/2 years before. While Reagan is praised as a small government conservative, his re-election was helped immensely by this rapid growth of government. This growth in government spending led to growth in demand for the production that could be provided from the then unemployed workers, and sparked the recovery from the 1981/82 downturn. Unemployment reached a peak of 10.8% in late 1982 under Reagan, substantially higher than the peak of 10.0% under Obama. But with government then expanding under Reagan, rather than contracting as under Obama, the unemployment rate fell rapidly under Reagan to 7.3% in September 1984, vs. 7.8% under Obama in September 2012. With government growth adding 0.85% points of GDP growth under Reagan, but subtracting 0.55% points under Obama, the net difference is 1.40% points of growth. If government spending under Reagan had fallen as it had under Obama (that is, had the contribution been 1.4% points less), the rate of growth of GDP under Reagan leading up to the election would have been only 3.8% annualized due to the direct impact alone, and only 2.4% with a multiplier of two on such expenditures. Looked at from the base of what growth was during the Obama period, growth (from the direct impact alone) would have been at a 3.4% rate had government been allowed to expand during the Obama term at the rate it had under Reagan, and growth would have been at a 4.8% rate with a multiplier of two. Put another way, if government spending had declined during the Reagan period at the rate it had during Obama’s term, the estimated resulting growth rate of 2.4% a year (assuming a multiplier of two) would have been similar to the 2.0% rate seen under Obama. Symmetrically, if government spending during the Obama period had been allowed to grow as it had under Reagan, the estimated resulting growth rate of 4.8% would have been similar to the 5.2% seen under Reagan. These resulting growth rates are similar for each. The different paths followed for government spending can by itself account for the differences in the growth rates observed between the Reagan and Obama periods, when government spending rose under Reagan but fell under Obama. A final issue to address is whether the fall in government spending under Obama since mid-2010 is a reflection of a sharp jump early in his administration (due perhaps to the stimulus package or whatever), from which a decline would be easy. This is not the case. Government spending in the second quarter of 2010 was 3.9% higher (total, not annualized) than it was in the fourth quarter of 2008, the last quarter of Bush. The total growth under the similar period under Reagan was 2.8%. The difference is just 1.1%. But as noted above, government spending was 13.4% higher by the second quarter of 1984 than it was at the same point in the Obama term. The 1.1% is minor compared to this 13.4%. The stories being told on the efficacy of the Obama and Reagan policies might therefore be quite different if one recognizes that despite the rhetoric, government expanded under Reagan while it contracted under Obama. Had government spending grown during the Obama term at the pace it had during the Reagan term, the economy would have grown similarly fast. Obama could then be running similar “Morning in America” ads as Reagan did, rather than explaining that while America has been heading in the right direction, there is much more to do. This entry was posted in Fiscal Issues and tagged government spending, Obama, policy, US politics by aneconomicsense. Bookmark the permalink.